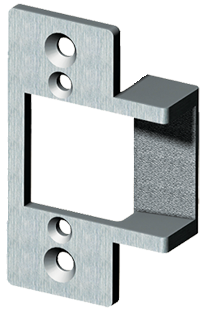 234 ANSI Faceplate - Smallest Electric Strike in the World, least cutting possible for any strike on a wood frame. Smallest Electric Strike in the World! For new or replacement installations in metal frames. Use with cylindrical locksets having up to 5/8� throw, based on 1/8� door gap. The smallest faceplate for the smallest electric strike in the world. BHMA Grade 1 - Your ANSI Solution.